Organisations in the information industry such as Book Publishers and Libraries would do well to learn from Encyclopedia Britannica’s precipitous fall from grace. Formerly a powerful company that could demand and receive large payments for access to it’s storehouse of human knowledge, it’s now been reduced to near irrelevancy and suffers the ignoble fate of being sold by discount clearance stores. The Encyclopaedia Brittanica set of printed volumes is the oldest continuously published reference work in the English language, having been in print without interruption since 1768. They were onto a good thing and made great profits for a long time but innovation in the form of vast amounts of free information on the Internet appeared unexpectedly from the periphery and dealt Encyclopaedia Britannica a knockout blow that’s left them woozy and barely hanging onto the edge of the boxing ring ever since. 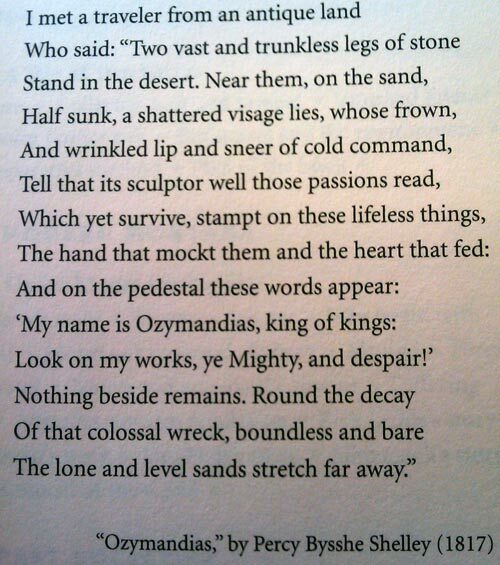 Like King Ozymandias in Percy Bysshe Shelley’s poem, Brittanica had believed that it was near invincible and any competitors to it’s throne would look at it’s mighty work, despair and give up. As Mark Pesce describes in his talk The Alexandrine dilemma, Britannica online was a subscription-based reference site for 5 years until 19th October 1999 when “the online version of Britannica containing the complete unexpurgated content of the many-volume print edition was unlocked and made freely available, at no cost to its users”. For the next few months Britannica Online became one of the most popular sites on the internet but in the face of having to service this traffic via more and more servers and escalating data transfer costs management decided to retreat into their shell, putting the content behind a paywall and charging a $7/month subscription fee. Traffic soon plummeted to previous low levels. This was their last best hope for success in the brave new online publishing world and yet they killed the experiment because of a crisis of over-popularity that any other website would have killed for. If they had been brave and far sighted enough to let their quality content stay free within the publicly available Internet and allowed crowd sourced updates to their encyclopedia entries than they could have possibly become the defacto source of information Wikipedia is today. The issues they faced were not new: all online publishers have struggled to find out how they can turn high-quality content into a money-making business where profits are greater than costs. Shifting back to a subscription model reflected a natural conservative urge by management to avoid relying on fickle online advertising income but in the end it was also Britannica’s downfall because organisational success on the internet directly correlates to how open the organisation is willing to be with it’s information and it has been demonstrated time after time that online readers are notoriously reluctant to pay for content hidden in private information silos regardless of it’s quality. Institutions like libraries and industries like Book publishers currently feeling the icy winds of change would be well advised to learn from this story and read books like The Wisdom of Crowds, Here Comes Everybody, Wikinomics, Crowdsourcing and The Wealth of Networks to decide how they will fight back against competitive threats in their sector. 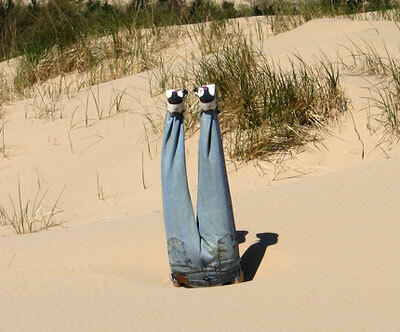 Putting your head in the sand and continuing with business as usual when faced with a bold new competitor that threatens your core product/service is irresponsible suicidal behaviour that threatens the jobs of employees and dooms owners/shareholders to huge losses as the organisation diminishes in importance over time. it would almost be worth wikipedia licensing part of the content so it is not lost, and allow its network of editors to add more recent information to the very factual and accurate Britannica data. A very succinct and clearly written description of what happened to Encyclopedia Brittanica. The same issues that big publishers such as EB are facing now are starting to be faced by universities. A small number of (generally) high profile universities around the world are making their learning content freely available whilst others are burying their heads in the sand and continuing to lock their content up. Those in the opencourseware movement are seeing benefits both at the institutional level and for individual faculty members. It is highly likely that, in future, we will see significant changes in the way that academics work at all universities. Why do we need the same content coverage being produced at thousands of universities for the same subjects? As a student I will be asking questions if I can see far better learning content freely available from MIT than what I’m getting locked up in my own uni’s LMS. Lots more thoughts but don’t want to go on. I think it is very fluid at the moment and difficult to predict but I do think that the next ten years will be one of the most critical periods in higher education for at least 600 years. Having worked in the publishing industry for many years I am glad to read your post. The publishing industry may find it safe in the short term to put its content behind a paywall and ask for subscriptions, but in the long term this approach will do them much damage as they lose subscribers, readers and more importantly content providers like authors as they begin to publish directly without the use of a publishing house. Using the wisdom of the crowds, engaging in social networks online with readers and authors will bring them new ideas and their users will be right there with them as they find new opportunities and develop new business models. There’s a lot of rubbish on the web, publishers need to be in the business of validation and quality control – this is especially relevant in STM publishing. Its naive to think we can trundle on as normal, the publishing industry isn’t adapting anywhere near quick enough at the moment. Publishers will exist in 10 years time, but they won’t look anything like they do today. In hindsight, confronted with the rapid growth of the web, Encyclopaedia Brittanica made poor decisions. Isn’t there also a even bigger, more sobering lesson? People refuse to pay 4 digital products or information. Could it be true the only really successful business model on the web is to use it to sell physical products? EDITOR: That aspect is something I haven’t thought about, I guess pureplay content websites are very hard to make profits from by themselves. Great article Neerav. Very interesting. Hi Neerav, I started to reply here and then realised I was was working my way to a fairly lengthy post so I moved it over to my blog. In essence I believe that the type of content published plays a really big role. News and general reference are easily reproducible – thus they are now readily available for free. Publishers need to focus on the content that is not available anywhere else, that requires a high level of skill and effort to create. There will still be a market for this. More in my post The decline of the Encyclopedia: a timely object lesson? (b) then quite quickly the very thing that has made your product valuable (i.e. fact checked & professionally researched articles) is no longer valued in the same way as previously. Few organisations seem able to develop metrics that help them to detect seismic shifts in the competitive landscape. An interesting parallel is the iPhone & all the other mobile phone manufacturers. The entire playing field has shifted from the simple mobile phone to a converged mobile computing/music/video device and the other manufacturers are scrabbling to catch up. The problem for EB was that they were in the middle of a genuine paradigm shift (in the Kuhnian sense) and that they did not realise it (nor did many of us back in those days). This is the shift from a society of the book to a society of the network. We are still only at the beginning of this shift and EB was an early casualty. It is interesting to consider how EB could have predicted this shift in the competitive landscape, or how it could have obtained & used competitive intelligence to detect the new trends. This is precisely the problem to which Christensen refers in the Innovator’s Dilemma. It often remains very difficult for successful incumbents to change what they do and how they do it until too late. Great article, very informative. The internet will always win against non-software based products now, if it is possible to reach the same goal. I am unsure about my feelings towards EB, it is before my time – which shows how much of an impact the internet has had over the last 20 or so years. Encyclopaedia Britannica did not think that an open source product like Wikipedia would significantly challenge the credibility of its brand. 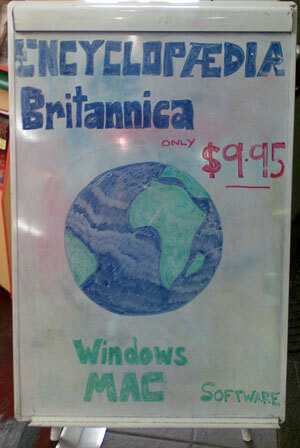 They were dead wrong and Encyclopaedia Britannica’s staff seriously misread the global market. They are now very concerned about the widespread use of a free Wikipedia vs their paid subscription model. From a corporate and financial perspective, Encyclopaedia Britannica is in significant trouble. I think this is an example of valuing product over brand. Clearly there is strength in the EB offering – it is a quality product. But it is also a premium product. And like any industry, publishers are slow to develop and implement business model innovation – they simply applied their old, out-dated business model to the web and found that it failed. The web, however, operates on social judgement. And the driving force behind this is trust. Rather than looking at the value of their product, EB should have looked at the value of their brand and re-envisioned the way in which their product could have been taken to market. Indeed, the opportunity (still exists) is to create NEW markets. Good summary of what happens when one does not recognize the environment and adapt to suit – a bit Darwinian! `New’ technology has so much to offer. It is frustrating to see digital reflect analogue content rather than the digital medium explore new ways of presenting content. We need to look at the business model with fresh eyes rather than using the old model as a guide – I guess that it will eventually evolve. Even though hindsight is a wonderful thing and human memory is not to be trusted, at no point in this saga did I or any commentator I read (and I may have missed some) say that EB were doing the right thing – until maybe they flung the doors open. I think the whole “defend the content” idea was wrong to begin with, and even more wrong (if that’s possible) to return to… but that’s easy to say now. In fact EB faced a very real problem well before the Internet and Wikipedia took hold. They had clung to life with an enduring business model that included direct marketing and door-to-door sales, with trusted folk in suits (yes, it was almost religious in its tone) offering you not just quality content (which after all was available at your local library) but also – more significantly – prestige on your bookshelf and an “investment” in your child’s future. How dated does that sound now? I think that the whole business model was flawed over time by demographic shifts – fewer people at home to answer the door, increasing wealth driven by women entering and re-entering the workforce, more diverse lifestyle options to tempt cash elsewhere and a move away from aspiring to own “prestige” books to, well, everything else. Late Baby Boomers (whatever they are) didn’t want a set of musty books they wouldn’t read, were into paperbacks now anyway and didn’t accept that EB was the clincher in their child’s education. All of this was happening by 1975, well before Wikipedia and the Internet. Although they had dumbed down (sorry, lightened) the content already, and had embraced new sales and marketing ideas, they really had to take some tougher structural decisions. I’m not sure they made the right choices, fast enough. By 1985 it was clear that owning a personal computer was now the educational investment of choice, and possibly more prestigious (and certainly more hip) than owning the EB. IMHO the “mass market” EB was sunk already and needed to radically rethink its business model. Instead it was reactive, rarely timely, and behind the game. Of course it only got worse. In their favour now is their remaining reputation, their past product (still highly valued by collectors) and their content. Perhaps they need to partner with more agile companies and leverage their content, or gracelessly exit what remains of their mass market and head back to the high-margin, prestige niche, coupled with rare-book reissues from their glory days. If there’s a lesson here for publishers in general, I guess it’s ‘expect the unexpected’. If you think you understand today’s threats and opportunities you are probably wrong. Oh, how the mighty has fallen. I remember years ago when the Encyclopedia Britannicas were the thing to have for any student. Even at garage sales, they were still pretty expensive. With all the vast information on the internet, it’s become obsolete. It’s a great summary of what happened to Britannica. Is that really true that “it has been demonstrated time after time that online readers are notoriously reluctant to pay for content hidden in private information silos regardless of it’s quality”? I personally didn’t pay anything and don’t want to pay for info as long as I’ve some other alternatives. How many of you are willing to pay for information? Would you spend money on Membership Sites? I am a big fan of Encylopedia and for years the only software I used on windows was Wikipedia. I am sure computer offline based readers and dedicated readers are the future. I do like buying books and arranging them in my shelf. But searchin them is trouble. So goona buy it. It wouldn’t be so bad were it not for the poor quality of Britannica. Several years ago when I gave up on it some articles were inaccurate or woefully out of date. As an Australian I was just offended by the poor quality and inaccurate material with some major stuff ups such as inaccurate population figures out by over 50%. Titan article several years after the Huygens probe was still not updated, and multimedia in general was poor quality. Then I looked at freely information and thought that even the article of ‘edited quality’ no longer stood, it seemed EB was now targetted to nothing more than young students homework assignments, rather than as a serious resource. I have not bothered to look at EB since 2005, so maybe it’s changed, but after watching it go down for 7 years before that, I don’t think so. A lesson to all new parents. Before investing in huge sums of money on items intended to benefit your childs educational development – do thorough research. If I had done so instead of listening to “sales talk” I no doubt would have saved our family a few thousand dollars, (back in 1984) had more space on my bookshelves without any detriment to our daughters education / knowledge bank. I will however keep my leather bound, full set plus science etc., updates for my potential grand / great grandchildren to look at in amazement. Titan article several years after the Huygens probe was still not updated, and multimedia in general was poor quality.